If you have sensitive teeth, then a 2 minute procedure per tooth with a laser provides an effective solution with no local anaesthesia. Although a permanent treatment for sensitive teeth, it should be noted that if further recession occurs in those areas, then they may become sensitive again. By removing debris and bacteria between your teeth and gums the result is Fresher Breath. The results are very quick and with good oral hygiene etc. the Fresh Breath lasts. If you suffer from cold sores or ulcers, then by using a laser's energy to minimise any sores developing and increasing the blood circulation. This helps improve healing in the area allowing the ulcers and the sores to heal more quickly than they would do otherwise. Take advantage of our Lasers capabilities including relief of lesions (aphthous ulcers, herpetic lesions). Laser energy can be directed at areas where surgery has been carried out, such as the placement of a dental implant or removal of a wisdom tooth. The laser improves blood flow and accelerates healing, reducing post operative discomfort. Most surgeries inside your mouth can be carried out using a laser as it has the benefit of minimising bleeding and pain during and after the procedure. Traditional scalpel and sutures cause more tissue injury, pain, swelling and bleeding. The appearance of your smile can be improved by contouring or shaping your gums using a laser. We safely remove excess gum tissue that may give you a 'gummy' smile, or make your front teeth appear irregular in size or shape. There is no bleeding afterwards as the laser seals the tissue as it removes it. In addition the degree of tissue control is much higher than would be the case using a scalpel or electro surgery unit. Lasers are used in addition to conventional root canal therapy to sterilise the canal. This improves the success rate by destroying bacteria in lateral and accessory canals that are not easily accessible by conventional treatment. Laser teeth whitening is a 1 hour procedure with results that can last you 2 to 3 years. A protective layer is placed over your gums and soft tissues before we apply the whitening gel to the teeth. The laser is then used to activate the gel in order to whiten the teeth. 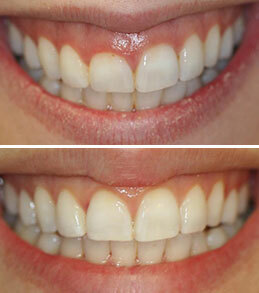 We always recommend that Laser Power Whitening is used in conjunction with trays. Studies have shown that our EPIC Laser can perform a full-mouth, in-office whitening procedure with an average of 4-6 shades in only 20 minutes of treatment time (not including set-up or take-down), faster than any other in-office whitening system. We use disposable single use tips for diode lasers. For more information on laser dentistry, call our practice in Cambridge, on 01223 363277.